30-day guitar challenge: When improvising, it’s nice to have the freedom to add a ‘flurry’ of notes now and again. Listen to how sax players often begin a phrase, or tail off at the end, and you’ll see what we mean. One way to achieve this is to rake across a triad, a device used by Mark Knopfler and David Gilmour. Another way could be adding in a couple of rapid notes after a big sustained bend, as Albert or BB King were fond of doing. Legato is another way to add ‘pizazz’ without sounding like you’re breaking too much of a sweat. In this solo, we’ve combined elements of all these approaches, adding in some economy picking, too. Adopting these techniques will allow you to articulate phrases rapidly across the strings with minimal effort. The recurring theme here is groups of triplets/sextuplets in pentatonic/bluesscale based patterns: pick the first two notes of each grouping of three with a down- or upstroke across adjacent strings, then hammer on or pull off to the 3rd. This isn’t sweep picking, but it has the central principle in common. Be prepared to work up to tempo, paying attention to posture and finger placement. In the same way that tapping can put fast licks under the fingers of rock players with comparatively little effort, this technique can supercharge your blues solos - but bear in mind that the example solo demonstrates a strong concentration of these ideas for you to ‘dilute’ to taste. Note the symmetrical pattern that leads into the first beat of bar 1. It’s generated by brushing the pick down from the third to the second string, then using upstrokes from the first to second string as it reverses back to the final F#. Don’t be surprised if this is trickier than it appears at first, though once you’ve mastered this, you’ll find most of the ideas here fall into place quite quickly. The big deal with this example is the inclusion of a b5 (F), but not where you would usually expect to find it in this shape of blues scale, at the 10th fret of the third string. Instead, to make this pattern work, we’re stretching momentarily down to the 6th fret of the second string, before resuming the more ‘regular’ pentatonic shape. We finish with a similar lick to Ex 1, this time an octave lower. The beginning of this example waits a little longer before using the upstroke to reverse back across the strings - long enough to hammer on and pull off the first string. Using shape 3 of the pentatonic scale, this is more unusual as we travel from the third through to the fourth and fifth strings, but there is a logic there once you’re used to it. Just keep routining it slowly and stay patient! Expanding to cover from fifth to first strings, this example is a demonstration of how you might use this technique to create longer flowing lines. We break off halfway through bar 2 in the name of variety, but it’s possible to continue all the way back down again if you prefer. 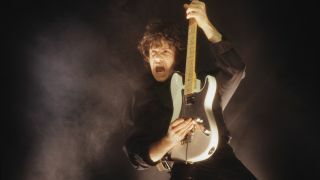 This was a favourite move of Gary Moore, who favoured this type of playing over standard alternate picking in his later blues material.